Wernicke's encephalopathy (WE) is the best known neurological complication of thiamine deficiency, characterized by ocular symptoms, mental confusion, and ataxia. Though a well known problem, noted primarily in alcoholics, WE is also described in malnutrition, prolonged parenteral nutrition, persons on slimming diet, dialysis, and hematological malignancies. , WE is said to be a rare entity in infants and in children. We report, herewith, a male child with unusual features, suggestive of WE; with thiamine treatment, the response was dramatic. A 12-year-old boy presented to emergency room (ER) with lethargy, confusion following repeated vomiting for 3 days. He was apparently well before and during the beginning of the holy month for Muslims (Ramadan); he started his fasting, which consists of withholding all forms oral intake of food and water from daybreak till sunset. This was his first religious fasting ever and he started performing it. On the 12th day of his fasting, at daybreak, he felt dizzy, vomited several times with abdominal discomfort. He complained of diminished vision and later with persistent vomiting he became drowsy and disoriented. He was brought to the hospital; on initial evaluation he was diagnosed as a case of encephalopathy and admitted for further workup. Neurological examination revealed that he was drowsy, arousable with stimulation but could not sustain his conscious state. He was afebrile, stable vital signs with mild dehydration and there were no meningeal signs. His cranial nerves examination revealed that he had ptosis of right eye lid with intact pupillary light response and normal extra ocular eye movements. There was no long tract signs except that he was ataxic while made to stand, which was attributed to his altered sensorium. Routine investigations including complete blood count and biochemistry were normal. Computerized tomography (CT) of the brain was normal and cerebro spinal fluid (CSF) examination showed normal proteins and less than four lymphocytes. He was hydrated with intravenous fluids and on 2 nd day of examination he was found to be ataxic with tremors of his upper limbs. With the clinical signs of encephalopathy, cerebellar ataxia and possible ophthalmoplegia, a diagnosis of WE was entertained and after collecting blood for vitamin B1 levels, he was started on thiamine 2 mg/kg by intravenous route for 7 days. He became fully conscious the next day, and ataxia improved in the next few days. He was on regular oral thiamine 50 mg two times daily and was periodically assessed. At time of discharge he was symptom free and even the ptosis improved. He was followed up after 4 weeks and there were no recurrence of symptoms. Blood thiamine level was 36 ng/ ml (normal 50 ng/ml) which normalized later. 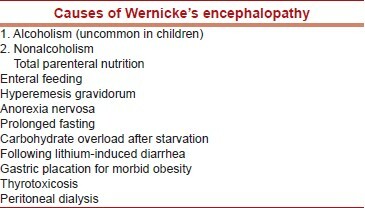 Wernicke described in 1878 four adult patients of encephalopathy with ophthalmoplegia with malnutrition. The autopsy then confirmed the characteristic hemorrhagic lesions in dorsomedial thalamus and periaqueductal/periventricular gray mater. The disease is said to be caused by thiamine deficiency. Beriberi is the systemic counterpart of thiamine deficiency and often manifests in cardiovascular collapse. Thiamine is an important co enzyme in glucose metabolism and it is converted into its active form, thiamine pyrophosphate. There are three important enzyme systems in the tri-carboxylic acid cycle in the liver, kidney, heart, and brain, which are dependent upon thiamine. A triad of clinical symptoms, namely, global mental confusion, ocular abnormalities, and ataxia are important in the diagnosis of WE. However, most of the patients may not manifest all the above symptoms always; instead a variable combination of presentations is sufficient to diagnose WE. Therefore, a high index of suspicion is necessary in the high risk patients with any of the above myriad of clinical symptoms. Extra neurological involvement had been also described in WE in children with predominant cardiovascular symptoms namely, chest pain, dyspnoea, tachycardia, and heart failure. Confirmation of the diagnosis is possible by reduced red blood cell transketolase levels and high serum pyruvate and lactate but the results could not be obtained immediately. Magnetic resonance imaging of the brain may reveal abnormal T2 bright signals in the dorsomedial thalamic nuclei and putamen with loss of volume of the mamillary bodies. WE is both preventable and treatable condition and treatment should be initiated to any patient who presents with any of the above clinical signs and symptoms, especially in the high risk group. The onset of the disease may be acute, sub acute, or chronic and symptoms of classical triad may not be evident. Therefore, thiamine therapy is needed if any of the components of WE triad is present in an appropriate clinical setting. If untreated, patient may develop hypothermia, hypotension, and respiratory failure and so early treatment could avoid such complications and fatality, provided physicians were aware of this disease. Although known in malnutrition or in patients on parenteral nutrition, our patient was an apparently healthy boy who responded to thiamine with the clinical suspicion and management. Despite its extensive description a century ago, WE continues to be an under recognized disorder, especially in children and so a high index of suspicion is essential for the appropriate diagnosis. Since this disorder is both preventable and treatable, identifying clinical features at the early stage could reduce the morbidity and mortality to a large extent. 1. Victor M, Adams RA, Collins GH. Wernick-Korsakoff syndrome related disorders due to alcoholism and malnutrition. Philadelphia: F A Davis; 1989. 2. Hahn JS, Berquist W, Alcorn DM, Chamberlain L, Bass D. Wernicke encephalopathy and beriberi during total parenteral nutrition attributable to multivitamin infusion shortage. Pediatrics 1998;101:E10. 3. Miyajima Y, Fukuda M, Kojima S, Matsuyama T, Shylaja N, Aso K. Wernick's encephalopathy in a child with acute lymphoblastic leukemia. Am J Pediatr Hemotol Oncol 1993;15:331-4. 4. Donnino MW, Vega J, Miller J, Walsh M. Myths and misconseptions of Werncike's encephalopathy: What every emergency physician should know. Ann Emerg Med 2007;50:715-21. 5. Decker MJ, Issacman DJ. A common cause of altered mental status occurring at an uncommon age. Pediatr Emerg Care 2000;16:94-6. 6. Harper CG, Giles M, Finlay JR. Clinical signs in Wernicke-Korsakoff coplex: A retrospective analysis of 131 cases diagnosed at necropsy. J Neurol Neurosug Psychiatry 1986;49:341-5. 7. Vaconcelos MM, Silva KP, Vidal G, Silva AF, Domingues RC, Berditchevsky CR. Early disagnosis of pediatric wernicke encephalopathy. Pediatr Neurol 1999;20:289-94.